Safeway Weekly Flyer November 7 - November 13, 2018. Spread Some Holiday Cheer! 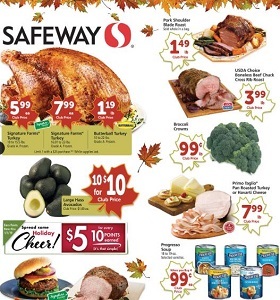 Safeway Weekly Flyer November 7 – November 13, 2018. Spread Some Holiday Cheer! -$12.99/lb Jumbo Snow Crab Clusters; $8.99/lb Ruby Red Trout Fillets. To see the weekly circular for your favorite Safeway store, search by ZIP Code or city, state.